To provide insight into how visitors find and use our webpages so that we can evaluate and develop our site. This helps us understand how our Bing campaigns perform by tracking actions on our website once ads have been clicked. This helps us learn how our users have interacted with advertising served to them on Twitter. These cookies contain no personally identifiable information but they will use your computer’s IP address to know where in the world you are accessing the Internet. Google stores the information collected by these cookies on servers in the United States. Google may transfer this information to third-parties where required to do so by law, or where third parties process the information on Google’s behalf. We may participate in Facebook’s ‘Custom Audience’ program, which enables us to display adverts to our existing supporters when they visit Facebook. We may provide your email address, mobile number and address to Facebook, so they can determine whether you are a registered account holder with them. Our adverts may then appear when you access Facebook. Your data is sent in an encrypted format that is deleted by Facebook if it does not match with a Facebook account. For more information please see https://www.facebook.com/business/help/744354708981227 and Facebook’s Data Policy at https://en-gb.facebook.com/policy.php. A link to further information on the Google Analytics Opt-out Browser Add-on is provided below for your convenience. Users contacting this website and/or its owners do so at their own discretion and provide any such personal details requested at their own risk. Every effort has been made to ensure a safe and secure form to email submission process but advise users using such form to email processes that they do so at their own risk. This website and its owners use any information submitted to provide you with further information about the products/services they offer or to assist you in answering any questions or queries you may have submitted. This includes using your details to subscribe you to any email newsletter program the website operates but only if this was made clear to you and your express permission was granted when submitting any form to email process. Or whereby you the consumer have previously purchased from or enquired about purchasing from the company a product or service that the email newsletter relates to. This is by no means an entire list of your user rights in regard to receiving email marketing material. Your details are not passed on to any third parties. Although this website only looks to include quality, safe and relevant external links, users are advised to adopt a policy of caution before clicking any external web links mentioned throughout this website. 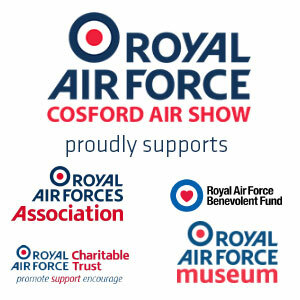 RAF Cosford Air Show Office cannot guarantee or verify the contents of any externally linked website despite best efforts. Users should, therefore, note they click on external links at their own risk and this website and its owners cannot be held liable for any damages or implications caused by visiting any external links mentioned. Communication, engagement and actions taken through external social media platforms that this website and its owners participate on are customs to the terms and conditions as well as the privacy policies held with each social media platform respectively. Where the RAF Cosford Air Show Office is using your personal information on the basis of your consent, you have the right to withdraw that consent at any time. You also have the right to ask the RAF Cosford Air Show Office to stop using your personal information for direct marketing purposes. Right to be Informed – You have the right to be told how your personal information will be used. This policy document and shorter summary statements used in our communications are intended to be a clear and transparent description of how your data may be used. The right of Access – You can write to the Data Protection Officer asking what information we hold on you and to request a copy of that information. From May 2018 we will have 30 days to comply once we are satisfied you have rights to see the requested records and we have successfully confirmed your identity. The right of Erasure – From May 2018, you have the right to be forgotten (i.e. to have your personally identifiable data deleted). In many cases, we would recommend that we suppress you from future communications, rather than data deletion. The right of Rectification – If you believe our records are inaccurate you have the right to ask for those records concerning you to be updated. Right to Restrict Processing – In certain situations, you have the right to ask for processing of your personal data to be restricted because there is some disagreement about its accuracy or legitimate usage. Right to Data Portability – Where we are processing your personal data under your consent the law allows you to request data portability from one service provider to another. This right is largely seen as a way for people to transfer their personal data from one service provider to a competitor. Right to object to automated decisions – In a situation where a data controller is using your personal data in a computerised model or algorithm to make decisions “that have a legal effect on you”, you have the right to object. This right is more applicable to mortgage or finance situations. The RAF Cosford Air Show Office does not undertake complex computerised decision making that produces legal effects. We collect and use personal information such as name and address details along with other contact information such as email addresses and telephone numbers. We also collect information about the services you use, any purchases or financial transactions you make, or any marketing contact preferences you give. We maintain a record of communications we send to you and we will log any communications that you send to us. We may also ask for other information like date of birth, your interests, and reasons for your custom. We will retain your personal data in line with our grantee’s expectations and requirements or unless a valid business reason exists which means we need to retain personal data for longer or until you request its deletion. We will endeavour to remove any personally identifiable data from our records where practical and reasonable for us to do so.